One very definite – albeit somewhat unfortunate – sign of rock ‘n’ roll’s growing commercial might is starting to become apparent with the rise of the cover song within rock itself. That is to say the act of one rock artist covering another rock artist’s hits, a practice which eventually would be done away with as the originators of songs would rebel when it was done by pop acts in the mid-1950’s, but for the time being it was ubiquitous in ALL forms of popular music. All music that is except rock… sort of. The fact of the matter is rock simply wasn’t viewed as having broad enough appeal in 1947-1948 for artists from other genres to take a whack at appropriating their songs, that is if they even approved of the songs which they certainly wouldn’t for the most part. Rock artists themselves meanwhile had thus far seemed more bent on establishing their names on their own material, or else appropriating older songs that were ripe for radical re-invention. Now it’s true we’ve had a few notable exceptions, most famously with Wynonie Harris copping both sides of Roy Brown’s debut – the record that launched rock ‘n’ roll to begin with lest we forget – and there can be little question that Harris’s subsequent chart topping version of Good Rockin’ Tonight is what fully established rock ‘n’ roll as the commercial powerhouse it quickly became. But for the most part rock artists had largely steered clear of the practice until recently, or at least certainly hadn’t engaged in it to the extent that pop music indulged in this widespread yet genial theft. In those fields cover versions were so widespread that both Billboard and Cash Box magazines actually published lists of the Top Ten songs each week (a different list than the Top RECORDS) with the criteria being how many competing versions were on the market at the time, which usually ranged from 6-8 by top artists, all of which pulled down heavy sales and airplay. Though it’s incomprehensible in today’s world that was simply the reality back then and I suppose it was inevitable that rock artists would begin to jump on board once the hits in this field started piling up and made increasingly enticing targets to try and score a piggy-back hit of your own by taking a song that was proving popular with the same audience you were trying to reach. By the fall of 1948 this trend began to pick up steam. The Ravens tackled a It’s Too Soon To Know done first by fellow bird group The Orioles and while their version didn’t wrack up the same sales or chart placement, they DID get a smaller hit out of it which surely made it seem worthwhile for them. Not long after that Amos Milburn had covered (non-rock) Red Miller on Bewildered and scored a chart topper with it. Today, perhaps fittingly if you take a dim view of the practice as those of us who came of age this century tend to, Milburn himself was being targeted by Jimmy Preston, an artist who had been methodically building his own résumé with a succession of increasingly strong singles, each one expanding upon – and improving – what came before it. It was a bit of a curious move for Preston to make, even taking the habits of the day into account. Instead of trying to consolidate his gains with an original song crafted by him, or specifically for him by someone else, we’re confronted with trying to evaluate Jimmy Preston’s continuing progress by examining a song that was a cover version of a current hit, Hold Me Baby, done exquisitely a few weeks back by Milburn, arguably the biggest rock artist on the planet. Is this shaping up to be career suicide or a bold move designed to show the world he could compete with the elite of the field? Though on paper this shapes up to be a huge mismatch in terms of talent, name recognition and even to a degree record label clout (not that Aladdin was a huge company, but certainly with more distribution reach than Gotham) the gap between the two may have been narrowing. When Preston first appeared on record last November with a decent instrumental Messin’ With Peston it came at a time when Milburn was just breaking through to stardom himself after two years of incredibly consistent, diverse and often outstanding records and he closed the year out with two consecutive #1 hits. The fact Milburn also wrote Hold Me Baby (which incidentally would reach #2 on the Charts), as he did most of his releases, was just one aspect of his abilities. He was also brilliant pianist and a soulful singer who excelled on both uptempo stomps and – as in the case with this song – more emotional ballads. Preston came up short in all of those categories. He was an alto saxophonist of fairly modest means, basically a decent journeyman thrust into the spotlight who tended to let his supporting cast handle the heavy lifting on the instrumental side of the equation. He did compose but wasn’t nearly as prolific in that regard as Milburn was, and in fact to date most of his material, including his best single by far, had been written by outside sources. Meanwhile his singing voice was serviceable but hardly anything to get excited about and at best you could say he transcended his limitations, unlike Milburn who often elevated weaker material with his vocal ability. Yet Preston was a dogged survivor. 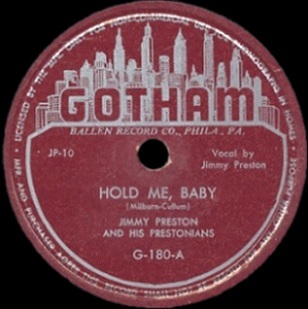 A Philadelphia club performer who found himself presented with an unlikely opportunity in his mid-thirties when Gotham Records was looking for local artists to bolster their roster and perhaps give them an entryway into the growing rock landscape, Preston had made the most of his opportunity and had rewarded them with their first hit his last time out in Hucklebuck Daddy, a record capable of standing with all but the absolute best sides released to date in rock. Ahh, but Milburn had been among the few who’d surpassed that standard, multiple times to boot, and so taking him on in a head to head matchup while Milburn’s version was still peaking no less was a potentially risky venture. For the first time audiences were waiting anxiously for the next Jimmy Preston release and something completely original would be more apt to draw attention for his burgeoning appeal whereas by releasing a song already firmly established in the same audience’s mind by a more capable singer with a better band – and a song Milburn himself wrote – might show him to be nothing more than a second rate talent and in the process undercut his momentum just when he needed to capitalize on it. But you gotta hand it to ‘em, whatever the outcome they certainly had balls and that’s something that would long be admired in rock ‘n’ roll, so let the battle begin. The first question that will have to be answered in all of these cases is trying to discern what was the artistic intent of the cover artist in tackling the song? (We obviously know the actual intent was commercial larceny, so we put that aside altogether). Was the cover artist trying to merely imitate the original, sticking as closely to the delivery as possible, or were they attempting to bring their own perspective to the task at hand, maybe shore up what they viewed as deficiencies, or at least inject an aspect of their own musical persona into the mix? On Milburn’s Hold Me Baby he started off with a declaratory shout on the attention grabbing intro before settling into a mellower crooning style that played to his vocal strengths and imbued the storyline with a heavy layer of seductiveness. Preston has no such ability to woo a listener with the melodious sound of his voice. He’s got much more limited skills with which to work and so following Amos’s blueprint would likely result in comedic disaster, so instead he takes a middle-of-the-road approach that belies such a mild description. HIS take on Hold Me, Baby treats the verbal come-on the lyrics present as less a seduction and more of a straight-forward, almost harmlessly crude, proposition. For starters he eases back on the enthusiasm and volume of the intro which makes it less jarring to hear blasting out of the speakers, but then whereas Milburn instantly dropped down into a lower tone to confide his desires to the woman in question as well as to the listener, Preston chooses to remain at the same level he began with as if he’s spotted a girl at a bar, smiled at her and got a smile back, and now is cutting right to the chase and seeing just how interested in hooking up she might be. The result is a song that has far less shading to its meaning, no lines to read between, no mood to pull you under with, yet also one that’s much easier to appreciate in passing. In Preston’s telling of it the storyline becomes secondary to the generalized situation, something that in this instance works rather well. Part of this may have to do with the adulterous thread running through the lyrics. Milburn, because he’s singing it in such a seductive manner, comes across as somewhat off-putting. 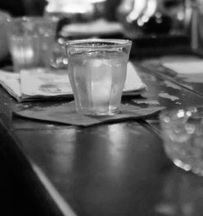 While Amos is far too sophisticated to ever appear out and out sleazy, the persona he adopted on that makes it clear he isn’t someone you’d feel good about sitting next to at the bar watching him work on women by turning on the charm, opening his wallet and trying to break down their defenses by methodically undermining the girls own better judgment. There’s no doubt he’s effective at it, but it’s too calculating and shallow to be an appealing character trait no matter how well he plays the part as a performer on record. Preston on the other hand – as befitting his real life attributes which are much less prodigious – comes across as more of a nonchalant everyman, someone you’re not inclined to take all that seriously when he’s hitting on a girl. For his part he doesn’t even seem that wrapped up in scoring with her as much as he’s just using this as a way to flirt over the din of the crowded club. Not being a girl I can’t comment on which approach is more offensive (or more successful for that matter), but from a distance Preston’s style seems easier to extricate yourself from without feeling you dirtied yourself by engaging briefly in the back and forth banter with him for some laughs. This more relaxed vocal delivery wouldn’t be nearly as effective wrapped in the tighter arrangement Milburn employed where his prancing piano took on a disarmingly lecherous feel before Maxwell Davis’s sensuous tenor sax solo acted like a third drink on an empty stomach, weakening the girl’s defenses as Amos closes in and slips her the key to his place. By contrast Preston’s bunch are much more upfront about their mindset, keeping up a nice stomping beat, a more constant and paint-peeling saxophone backing with some intermittent obscene honks thrown in for suggestive comedic effect. Their soloing takes on no subliminal impropriety but instead keeps this situated on the dance floor where the band knows this twosome is destined to part after she’s had enough of his rather clumsy, if slightly endearing, come-ons and heads back to her friends at the other end of the bar. Its entire mood is thereby changed considerably and Hold Me, Baby shifts from being an act of borderline creepy seduction to one of rather harmless flirtation. Amos Milburn, the character presented in his version of the song at least, is someone you’d steer your emotionally vulnerable female friends away from when going out for a night on the town, knowing she was likely to wind up in a strange bed the next morning, hung over and embarrassed and possibly in need of a round of penicillin. If she resisted his allurements you get the feeling that Milburn wouldn’t be content to let it go and move on to the next girl at the next bar but instead might wind up texting her until 4 AM trying to get her to reconsider (I know they didn’t have texting then, so substitute whatever stalker-like method of communication was likely to exist instead, maybe calling from a pay phone or tossing pebbles against her window). But that’s not the sense you get from Preston’s on-record persona should his attempts at picking her up fail. He’d probably just amble back to his buddies at the bar with a sloppy grin on his face, shrugging off the rejection or maybe even viewing it as no rejection at all, perfectly content that he got a dance and some witty byplay out of the excursion. Maybe girls have different views of this – the situation if not the music (either way, chime in ladies) – but in the realm of the desperate, mostly futile, attempts to hook up that occur each and every night, whether in 1949 or today, the Amos Milburn approach might be more successful (on record it certainly was, if you go by the sales figures) but the Jimmy Preston method seems slightly easier to take without feeling the need to jump in the shower after listening. In the end we’ll call it a draw on execution in terms of song craft and performance and when the records stop spinning I’ll just be glad I’m not a female forced to deal with any of this objectification and crudity on a nightly basis. Leave a reply on "Jimmy Preston: “Hold Me, Baby”"